CARL S. MILLIKEN, Secretary of State. 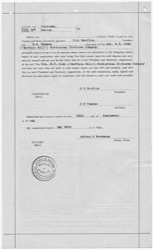 Indicate below if Foreign or Domestic. The COL. W.F. CODY ('BUFFALO BILL') HISTORICAL PICTURES COMPANY. 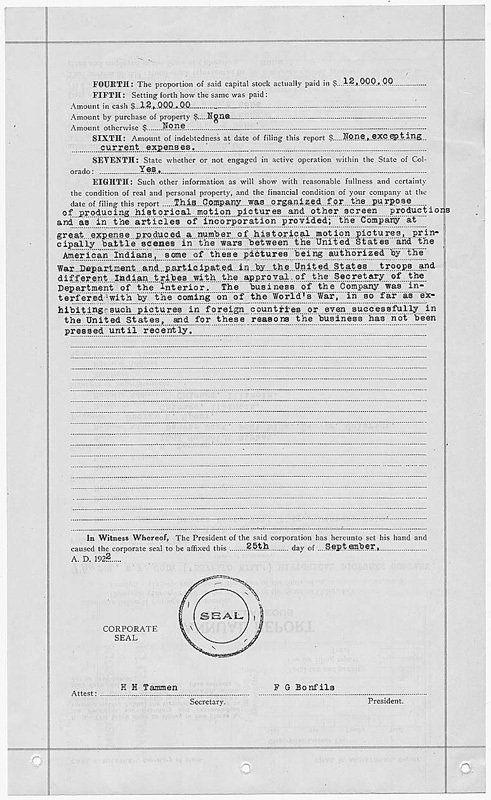 FIRST: Names of Officers and their several places of business. Residence 1500 East 10th. Ave., Denver, Colo.
Business Address Denver Post, Post Bldg., Denver, Colo.
Business Address Denver Post, Post Bldg., Denver, Colorado. F.G. Bonfils, 1500 East 1oth. Ave., and Denver Post, Post Building, Denver, Colorado; H.H. Tammen, 1061 Humboldt Street, and Denver Post, Post Building, Denver, Colorado; George K. Spoor, Chicago, Illinois; V.R. Day, Chicago, Illinois, and Louis Levand, Brown Palace Hotel, and Denver Post, Post Building, Denver, Colorado. Amount of increased capital stock, if any, $ none. SIXTH: Amount of indebtedness at date of filing this report $ None, excepting current expenses. SEVENTH: State whether or not engaged in active operation within the State of Colorado: Yes. 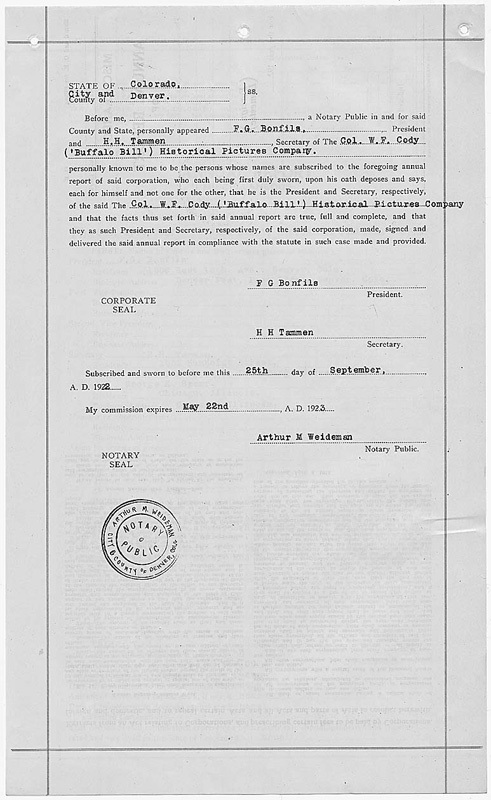 This Company was organized for the purpose of producing historical motion pictures and other screen productions and as in the articles of incorporation provided; the Company at great expense produced a number of historical motion pictures, principally battle scenes in the wars between the United States and the American Indians, some of these pictures being authorized by the War Department and participated in by the United States troops and different Indian tribes with the approval of the Secretary of the Department of the Interior. The business of the Compnay was interfered with by the coming on of the World's War, in so far as exhibiting such pictures in foreign countries or even successfully in the United States, and for these reasons the business has not been pressed until recently. 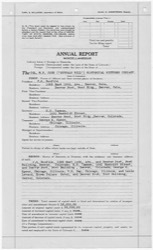 Before me, _______, a Notary Public in and for said County and State, personally appeared F.G. Bonfils, President and H.H. 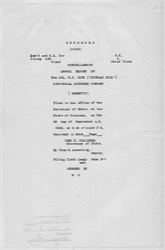 Tammen, Secretary of The Col. W.F. Cody ('Buffalo Bill') Historical Pictures Company. 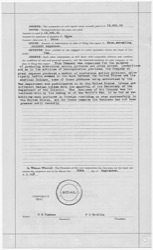 personally known to me to be the persons whose names are subscribed to the foregoing annual report of said corporation, who each being first duly sworn, upon his oath deposes and says, each for himself and not one for the other, that he is the President and Secretary, respectively, of the said The Col. W.F. 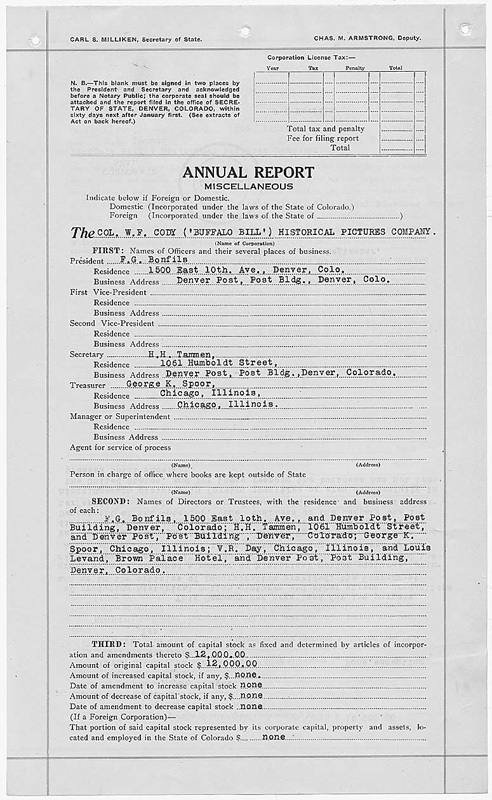 Cody ('Buffalo Bill') Historical Pictures Company and that the facts thus set forth in said annual report are true, full and complete, and that they as such President and Secretary, respectively, of the said corporation, made, signed and delivered the said annual report in compliance with the statute in such case made and provided. 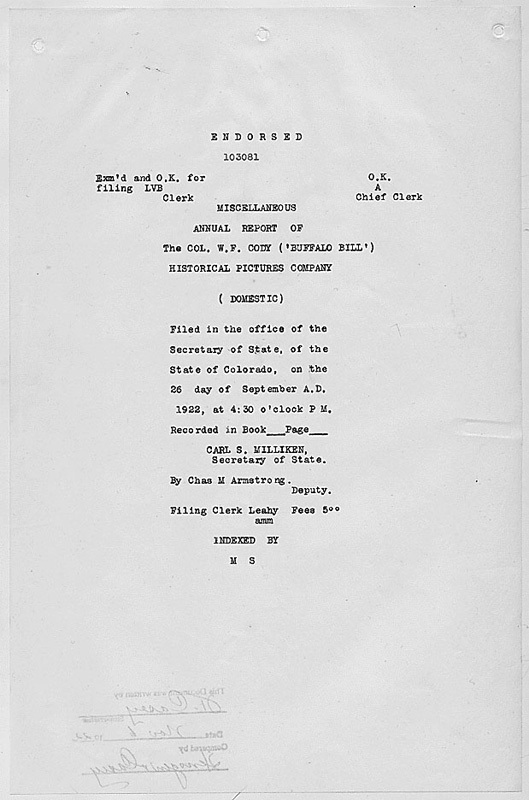 Filed in the office of the Secretary of State, of the State of Colorado, on the 26 day of September A.D. 1922, at 4:30 o'clock P M.